Formerly known as Palos Verde Estates, this Palm Springs neighborhood mixes Old World charm with mid-century modernism. We profile two sets of neighbors with distinctly different tastes. Homes ranging in size from cozy bungalows to impressive properties featuring upwards of 3,000 square feet make up this eclectic Palm Springs neighborhood, once called Palos Verde Estates because of the preponderance of Spanish-revival architecture. The neighborhood stretches from East Sunny Dunes Road to the north to East Palm Canyon Drive to the south, straddling Tahquitz Creek Channel. It’s bordered to the east by South Camino Real and South Palm Canyon Drive to the west. In 1947, architect Paul Trousdale began building here, peppering the neighborhood with mid-century-style homes, creating an eclectic variety that boasts Old Palm Springs charm and modernism. Partners in life and design reinvented their charismatictwo-story Mediterranean-style house with a dramatic makeover. “It’s arguably the cutest, most charming house in Palm Springs, based on the people who stop in front almost every day,” Troy Williams says proudly. And why shouldn’t he gush. He and Gino Dreese, his partner in business and life, lovingly restored one of only a few two-story homes in Tahquitz River Estates. But there’s much more to the tale. Nine years ago, this Spanish-style house at 276 E. Palo Verde Avenue, built in 1931 by Marjorie Main (or Ma Kettle, as she was better known), sat in wretched disrepair. 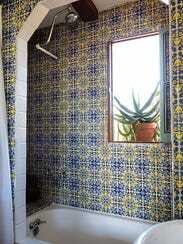 Windows were clouded and etched by water damage, elaborate tile work woefully disheveled and dingy and the rustic pavers that snaked through the Mediterranean-inspired space looked cracked and unkempt. Outside, the generous front and back yards fleshing out the double-lot property were drowning in a sea of dead plants and an untamed crush of tamarisk trees swarmed over the rough driveway that led to a long-forgotten casita. 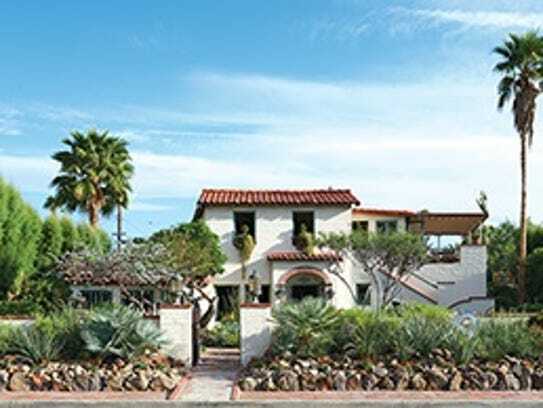 When Williams and Dreese happened upon the property after dining in Palm Springs, they didn’t see a dilapidated house and gardening nightmare; they saw a delightful Mediterranean villa that needed some spit and polish, a lot of sweat, and a considerable amount of cash. They believed that beyond the tarnish gleamed a brilliant architectural gem. “We saw the house and immediately fell in love,” Williams recalls. “Immediately,” his partner confirms. With self-contained upstairs and downstairs living areas, complete with kitchens, private entries and bathrooms, the house was tailor-made for Williams’ elderly mother Joan to live out her days in stylish comfort while surrounded by family. He and Dreese took the apartment upstairs, and mom occupied the downstairs main house until her passing last year. “She said it was the most beautiful house and garden she had ever lived in,” Williams remembers. Outside, the pair transformed the withered front yard into a vibrant drought-tolerant garden teeming with desert plants, succulents, cacti, blooming perennials, exotic citrus and tufts of lavender. Upstairs, ice plants dangle from iron shelving outside the windows. An above-ground pond accommodates a bale of red-eared slider turtles, 15 and counting, who enjoy sunning themselves on a large rock protruding from the water as the family dog Mar observes in rapt curiosity. In the back, a koi pond is also home to a large crayfish that occasionally scuttles across the deck into the pool. They are also crazy about collecting rocks. “Every rock tells a story,” Dreese explains. “We have them from all over the world, everywhere we go, and we cement them into our place in Joshua Tree.” But their gift for repurposing found items into whimsical designs doesn’t stop there. 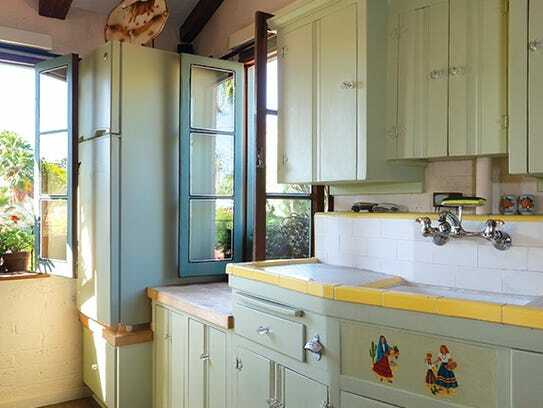 They incorporate tiles, driftwood, rusty tools, old toys and dinnerware — basically other people’s refuse — into unique additions to homes and gardens. A couch made of old bottles adorns their Joshua Tree ranch, and at Villa Vecchio, colorful glass pieces cobbled together from bottles enhance a bathroom window. The couple’s artistic handiwork, green thumbs and enviable knack for invention brighten almost every corner of their Palm Springs Mediterranean hideaway. Cobblestone interior walls and bucolic arches give the home an Old World feel, and an eclectic assortment of furniture and accessories culled from their travels and consignment shops enrich the pastoral ambiance.